South Africans headed to the polls Wednesday, in elections that the ruling African National Congress is expected to win in a landslide. “We will not ride roughshod over the rights of the people or bulldoze other parties into submission,” Zuma said. He added that he does not believe there is a cloud of suspicion hanging over him. “According to the country’s constitution, you are innocent until proven guilty, so there is no cloud, not even mist,” Zuma told reporters. In the past 15 years, the ANC has built 2.8 million houses and provided running water, sanitation and electricity to the poor. South Africa boasts a robust constitution and the strongest economy on the continent. Yet more than 1 million people still live in shacks, and the newly constructed homes have been found to be substandard, with many falling apart even before being handed over to beneficiaries. That’s the result of the awarding of government contracts to pals rather than those competent to carry out the work. And though the country’s economy has grown, it has not produced significant job opportunities. One in four adults is unemployed. At the same time, many senior members of the ANC have created wealth for themselves while majority of the country’s citizens wallow in poverty. Watch criticism of the ruling ANC » Violent crime also has escalated. Last year, nearly 50 people were killed daily, according to police. And though South Africa won the bid to host the Football World Cup in 2010, many say that the billions that are being spent on the tournament could be better used to lift the lives of the needy. Despite all the criticism, the ANC remains hugely popular. Most South Africans still consider the party of Nelson Mandela as their only political home. It is the party that helped end apartheid and bring democracy to the country. The only party that a majority of the country’s citizens, who are black and poor, believe can transform their lives. The emergence of the Congress of the People, or Cope, has however unnerved the ANC. Launched in December, Cope is made up of former ANC members who quit following ANC’s sacking of Thabo Mbeki as the country’s president. The latest polls predict Cope will get 15 percent of the vote, with the country’s official opposition, the Democratic Alliance, projected to receive 16 percent. 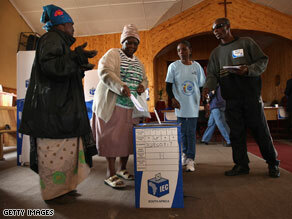 The ANC is expected to garner 60 percent, short of the two-thirds majority it is gunning for.